The subjects of this cabinet card portrait are Colonel Reuben Steere (1838-1915) and his wife, Rebecca (1853-1929). Steere is elegantly dressed and has a walking stick. Rebecca has unusually long hair which is displayed prominently. Reuben Steere was a native of Chepachet, Rhode Island. He was 44 inches tall and 43 pounds at maturity. He was a member of the Lilliputian Opera Company. In 1880 he married fellow Lilliputian, Rebecca Ann Myers of Indiana. The couple settled in Chepachet in 1882 and Reuben worked as a truant officer while Rebecca operated a restaurant and confectionary shop. This photograph was produced at the “photo parlors” of Rieman & Company. The studio was located on Montgomery Street in San Francisco, California. The address printed on the front of the photograph notes that the parlors were “Opposite Lick House”. What is Lick House? The name Lick House fosters all sort of silly images in my mind but the history of Lick House is actually quite interesting. James Lick was a renowned craftsman of wood products and a successful businessman. He began building Lick House in 1861. The building was two blocks long and three stories high. It was a luxurious showpiece hotel with 164 high quality rooms. It was considered one of San Francisco’s premier hotels until it burned down to the ground during the 1906 earthquake and fire. Advertising print on the reverse of the photograph includes the following two slogans, “Rieman’s Babies” and “When others fail, try Rieman”. Additional advertising on the reverse of the image are the names George R. Rieman and Fred H. Pray. At one time, Rieman and Pray were partners in operating a photography studio. 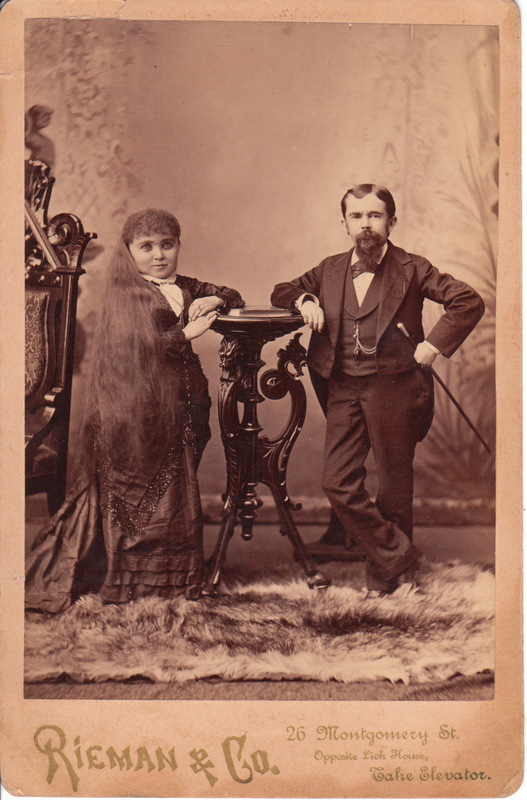 Writing on the the back of the photograph states the photograph captures “the smallest married couple in the world”. To view other photographs by Rieman click on the category “Photographer: Rieman”.